There are two types of people… those who keep an their email inboxes emptied out at all times and those who have over 1000 emails sitting in their inbox. Usually vowing that soon I’ll take some time, respond, look at the interesting ones, and sort out the rest. Okay, that may be a little more black and white than it really is, but you get the idea. I’m sure you know someone who has “inbox stress” if you aren’t personally suffering from it. This topic may seem a bit off from what I normally talk about, but it really isn’t. Getting stress and anxiety from looking at or thinking about looking at your inbox is completely unnecessary. I, at times, can fall into both categories very easily. I have a very organized, systematic folder system for emails I save. However, I wouldn’t file them away until I would take action which is how my inbox could easily get overrun. Then a month later, the emails that looked so interesting when I first got them are still sitting there, outdated. It’s not worth the stress. And it definitely isn’t worth the risk of losing a truly important email that needs immediate attention in a sea of “interesting” or “look into later” emails. Don’t you want to feel like a rockstar who is on top of things every time you open your inbox? Keep it simple. I like to keep a folder with the year and month on it and once the month is over, I put it into a larger, “archive” folder. I also keep main folders for regular topics. Things like account information, one for each kid, and the bigger, more global topics such as each of my businesses, education, expenses (this makes taxes a ton easier too! ), etc. I am a sucker for a good deal so I tend to want to leave emails about specials or sales in my inbox indefinitely. Again, totally not worth the stress. If I haven’t taken action on an email by this time, it goes to the trash or gets filed away. We waste a ton of time checking our email. When I have set times that I check my inbox, I know I can immediately respond to emails that need attention and either file away or delete most of them that aren’t immediate. This will also free up time for that yoga class you keep wanting to go to but don’t have time for! When I learned how to do this, it was like the keys to the universe were being bestowed upon me! I get plenty of emails that are educational or related to my business that aren’t time sensitive. I will want to look at later on when I have more time or I already have time set aside to look at. When I was working on creating my Podcast, I was told to take a 2 week course. Setting up a filter to where the email completely bypassed my inbox and went straight to the folder was a breath of fresh air! I didn’t have to look at the unopened email sitting there until I was ready to actually open it and give it attention. This has also been a godsend with emails from people who have valuable information that I don’t want to miss. They don’t clog up my inbox and I can open them when I have time to go through and really absorb the content. If you don’t know how to filter your inbox, it’s fairly simple. With google, it’s just going to the search bar in your inbox, clicking on the arrow on the right side of it. Enter the email of whoever regularly sends you what you need filtered, then click on the bottom right hand part that says “create filter for this search”. Check “skip the inbox” and “apply label” (then choosing which label), and saving. You can get more detailed but really it’s that simple. You can choose to filter certain words like “meditation”, “weight loss”, “exercise”, or whatever floats your boat. Then you can visit that folder when you actually have time to give the emails the attention you want to give them. This one can be hard for me because I am afraid I’ll miss something or forget who I want to look for later on. Truth is, if I am not getting real value from any of the emails someone is sending me, it does both me and them more of a favor if I just unsubscribe. You can always sign back up later on. For months I got emails from Delta airlines and I didn’t want to miss out if they had great deals on airfare. However, I always fly Southwest unless they don’t fly where I’m going. I have my Delta account number saved in my account folder so after (this is embarrassing!) 2 years of getting emails from Delta that I never read… I finally hit unsubscribe. Lesson learned. Bottom line… life is too short to stress over your inbox. Really, stress does gnarly things to you both emotionally and physically. If you put it into terms that your immune system is shot, you are gaining weight, or you lose sleep at night because of stress, don’t you want to limit stress in any way possible? Of course you do! If you are one of those who suffer from inbox shame, these tips will help. You’ll also want to sign up for my free I Love Me – 5 Days of Gentle Self-Care Challenge to find other ways to create little changes that reap big results. Do you have any crazy stories about inbox shame or awesome life-hacks I didn’t mention to keep your inbox under control? Let me know what they are in the comments below. And if you found this valuable, please share it. Over-stressed? Always tired? Pushing your needs to the backburner? Yearning to feel like yourself again? To find peace? Joy? Re-prioritize your own wellness in simple, easy to do steps, delivered daily! Your resources are now making their way to you! Keep your eye out for the e-mail, just to be sure it made it safely past the guardians of your inbox. If you don't see it, check your spam filter or promotions tab (if you have Gmail). You are invited to join the best tribe in the cosmos, Naturally You! It's a supportive and interactive community full of ways to shift to a healthier, happier, more natural lifestyle. Rise & Rock Your Morning Toolkit. It's Free! 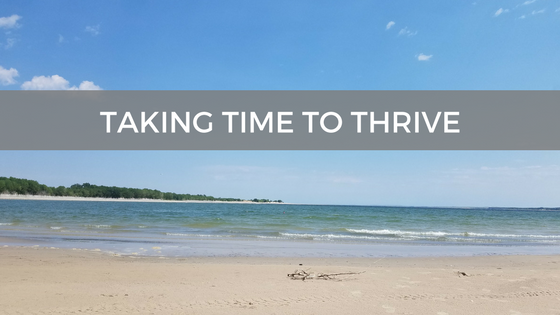 PLUS get free weekly tips about how to be more effective & have more time for things you love.